Popular traditions among Zelda fans: slay moblins, smash pots, collect rupees and ponder the nature of existence. How do the numerous games of the series all fit together? Until recently the prevailing opinion was that they don’t, although it sure has been fun to wonder over the years. But a 25th-anniversary commemorative art book called Hyrule Historia was published in Japan only a few days ago, and already its biggest secrets have hookshot all across the Internet: Nintendo has published an official Zelda series chronology. Eiji Aonuma, the producer for every major Zelda game since The Wind Waker, is credited as the book’s supervising editor, so this information is considered canonical. If you don't own a copy of the book, a diagram of the full timeline is available on GlitterBerri, where the timeline was first translated. Here's the quick version: the genesis of the entire Zelda story—and its rabid fandom, or so it often seems—lies with Ocarina of Time. At the end of that game, Princess Zelda sends Link back in time so that he doesn’t miss out on his childhood, creating two different timelines: one in which the Sacred Realm has successfully been protected and one in which Zelda lives on as an adult but no hero exists. This much we’ve seen before, but Aonuma outlines a third timeline in which Link failed to defeat Ganon in Ocarina of Time. 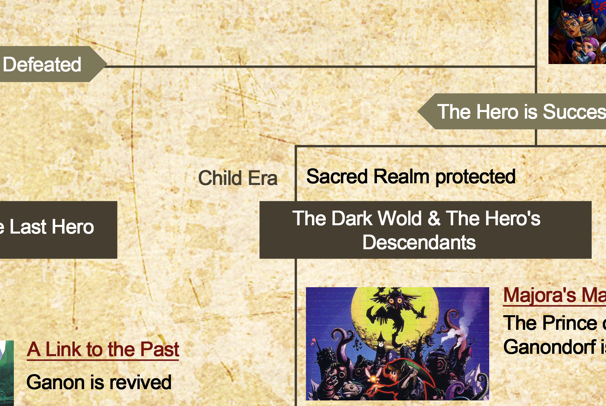 This Zelda timeline is the real deal. It's also really convoluted. Look, I’m a nerd; I get it. It’s fun to study and work out complex mythologies. But to be honest, all of this just strikes me as Nintendo trying too hard to fit a series of square games into a big round hole. I’m not a fan of alternate timelines unless they feed back together into a central narrative, significantly enhance each other through their differences, or serve as temporary diversions to make the game more interesting. Splitting a story into multiple paths with no intention of allowing them to interact with one another just dilutes the narrative. What’s worse is that this is obviously a massive retcon job; surely no one believes that any of this was intended back when Ocarina was being developed, especially since one of these divergent timelines depends upon Link being defeated in that game. It used to be pretty easy to just accept the various Zelda stories as independent retellings of the same basic myth (with the odd dream sequence on the side), and I believe more divergent images like Wind Waker’s submerged Hyrule castle have made those interpretations more interesting. It seems as though Nintendo is relying upon Ocarina of Time to provide a timeline split so that stories and settings which clearly do not fit together can all be treated as canon; it’s a contrived and unnecessary attempt to bolster the narrative of an already-beloved franchise. When the games are forced to glom onto one another, their individual values are diminished because they are less able to stand on their own. Is this timeline official? Yes. Is it comprehensible? Sure. But, if you ask me, we’re better off just forgetting this nonsense. Now, you’ll have to excuse me; I’m off to play Skyward Sword.